A Warning About Garage Sales…. This is a sad story that I think all Beatles collectors can relate to…. When you go to a garage sale (or you might call them yard sales) the thrill of the chase for that elusive LP or CD can sometimes see you just not taking enough care. It recently happened to me. Went out as I sometimes do on a Saturday morning to a local garage sale. These can be rich pickings (or not – but you never know). Did the quick scout around upon arrival – but there was no vinyl in sight. There were a couple of compact discs – but nothing remotely Beatles-related. So before leaving I posed the usual question to the owner of the house, just on the off-chance: “Do you have any records? LPs or 45s. You know, vinyl?” It never hurts to ask. “Oh – yes. Actually we do, but I hadn’t thought to put them out. Are people still interested in them?” And off she goes, into the house to hunt out said vinyl records…. About 5 minutes later (it seems like ten) out they come, boxes of them – frustratingly one box at a time. Most are pretty bashed up – but quite an eclectic selection and some interesting things – and by this stage another record collector has arrived and is also interested…. The first thing I see is a picture disc copy of Pink Floyd’s “Dark Side of the Moon”. Hmmm. Could probably get that. Might as well for A$1.00. (Its actually the same as this one – selling online for US$75.00). There’s also, for some strange reason, lots of Jethro Tull. All original pressings and all in reasonably good condition. Probably collectors items for the right person – but not me. Then some Hendrix. Tempting, but the other collector seems really interested and so I let him have free reign. Then finally a box with some Beatles. Both me and the other guy fall upon it and kind of unofficially, by mutual agreement, agree to split the contents amicably. No need for aggro on a Saturday morning over $1.00 records. He finds “Abbey Road” and I think: “OK. You can have it. I’ve got lots of pressings of that.” It’s the Australian pressing on Apple by the looks of it. He is happy. 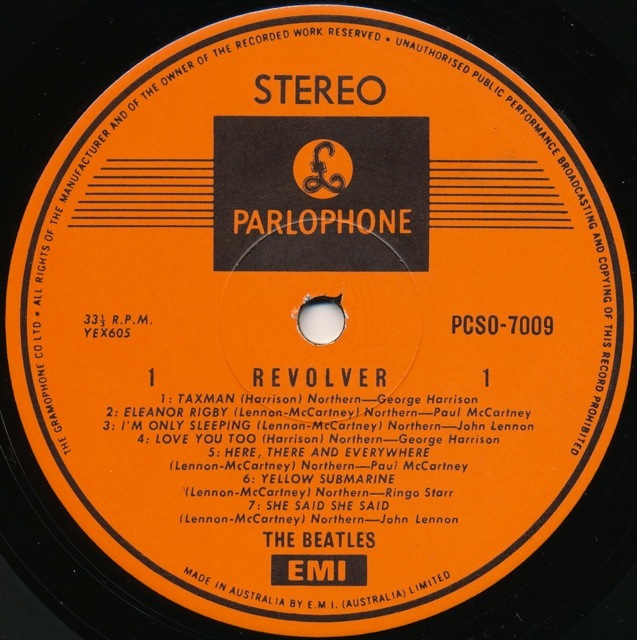 I find a copy of “Revolver”. Its also an Australian pressing, this time on the orange Parlophone/EMI label and I can’t remember if I have this or not and so decide to get it anyway. Its actually in pretty good shape and for a dollar, what the heck?. When I get home later turns out I don’t have this particular pressing. Good one! Then there’s a copy of the Beatles “Oldies…but Goldies!”. It too is an Australian pressing and I know I have this and so let the other guy take it. More good karma points for me. Then there’s a copy of “The Beatles”, or the “White Album“. Its an older, original Australian pressing on Apple – the one with the top-loading cover, and its got the poster. No Beatle pictures included though, and the cover is a little battered, but still, its kind of rare and interesting because of it’s age. The old-style top-loader cover is mildly collectable. I flipped out Disc 1 for a quick look to see if it was scratched and useless. It was in pretty good shape and so I decide to get it. Move forward in time now about three hours. I’m back home cleaning up the LP’s I got and I pull out Disc 2 of the “White Album” from it’s sleeve and guess what? Its not the “White Album” in there but “Abbey Road”!! So, a lesson for all garage or yard sale hunters: always check the contents of the CDs or LPs you’re interested in before you leave the premises…. 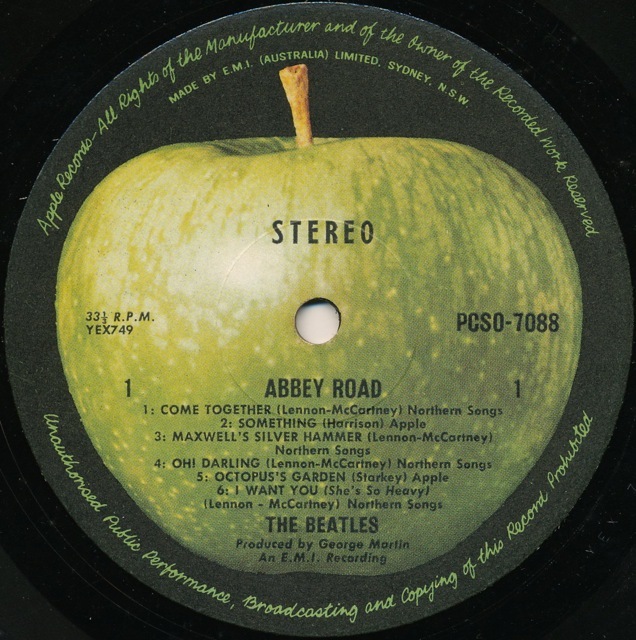 This entry was posted in Apple Records, Beatles, Beatles Collecting, Uncategorized and tagged Abbey Road, Apple Records, Beatles, Beatles Collecting, Revolver by beatlesblogger. Bookmark the permalink. I have 2 Abbey Road albums. One of them has an extra song on it. Would this be worth anything to a collector? I have wondered about this for years. If you have an LP with the song listed on the record cover itself then it would be mildly interesting to the collector but not a huge collectors item.